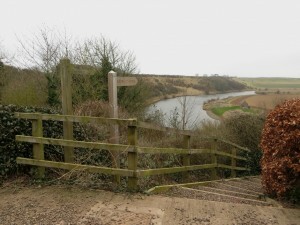 I have had my eyes on a walk following the River Tweed for some time, a footpath follows the south side of the river from Berwick to Norham and beyond. It would include visiting the Union Chain Bridge and the villages of Horncliffe and Norham. I had wanted to do it on a summers day, but I decided it had been sitting on my to do list long enough, grasped the bull by the horns and went for it on a windy and overcast early spring day.